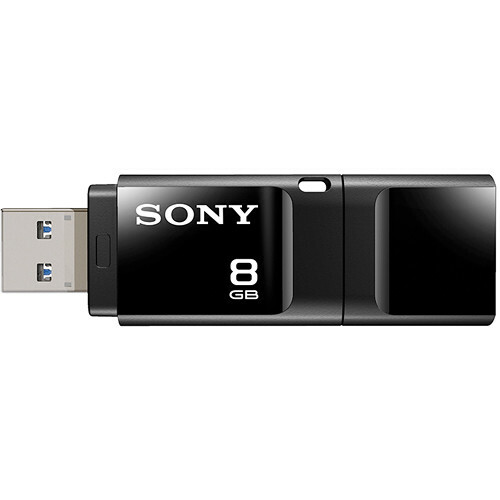 The black 8GB Microvault USM-X USB Flash Drive from Sony is a portable way to bring your data with you or transfer it to and from a computer using USB 3.0 technology. This USB Flash drive is compatible with both Windows & Mac and features a storage capacity of 8GB. When inserted into a host computer, the drive's Device Drive Identification feature allows it to be identified by name by that computer. If you have multiple devices connected, this feature allows you to quickly identify your Microvault. For your convenience, the cover on the drive's connector snaps on to the rear part of the drive so you won't misplace or lose it when the drive is inserted into a computer. As an add-on for Windows users, complimentary data security and slideshow software (x-Pict Story) can be downloaded from the manufacturer's website. Box Dimensions (LxWxH) 3.071 x 2.756 x 0.236"